Oh, baby! | Travel Musings • Yummy Insights • Join me on my tasty journey! I’ve been eating them for years, and making them for decades. Babies, folks. Dutch Babies. Golden, hot, pillowy cushions of fluffy egg goodness. A perfect blending of savory, tart and sweet (at least in my incarnation). Taking a minimum of usually-in-the-fridge-and-pantry items, in a half an hour Dutch Babies can be yours. While mixing the following ingredients in a blender, fire up the oven to 450 degrees and place a cast iron skillet on the middle rack. My skillet is 8″ diameter, but you can proportion the recipe up or down as necessary for your skillet’s size. Toss 5 eggs into the blender and whirl until a frothy light-yellow. Add alternately 2/3 C flour and 2/3 C whole milk. Mix until thoroughly combined, then add a 1/2 tsp of salt. Now back to that smokin’ hot skillet: once it’s up to temperature, toss a half cube of butter into it until nearly melted. Quickly pour the egg/milk/flour mixture in, and set the timer for 15 minutes. Once your baby-in-the-making begins to puff on the edges (at the 15 minute mark) turn the temperature down to 375 degrees until it has a uniform brown and the center has fully set. Immediately remove from the pan, add a dollop of butter … Sprinkle with sifted powdered sugar and drizzle with lemon (or lime juice) to your preference. Work quickly, as these deflate quickly once pulled from the oven. Although I’ve only had the aforementioned topping, other recipes call for the addition of a tablespoon of sugar, a half-teaspoon of cinnamon, a teaspoon of vanilla and a topping of homemade apple pie filling. 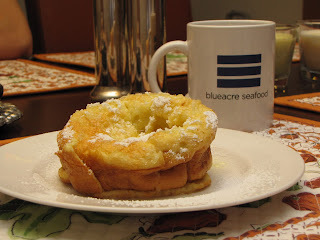 Blueacre Seafood in downtown Seattle is the first restaurant I know of in the core of the city to offer Dutch Babies on their weekend brunch menu. Their addition of macerated strawberries and house made Cool Whip sounds delicious! History: Manca’s Cafe at 2nd & Columbia was opened in the early 1900s – closing somewhere in the early 1950s. 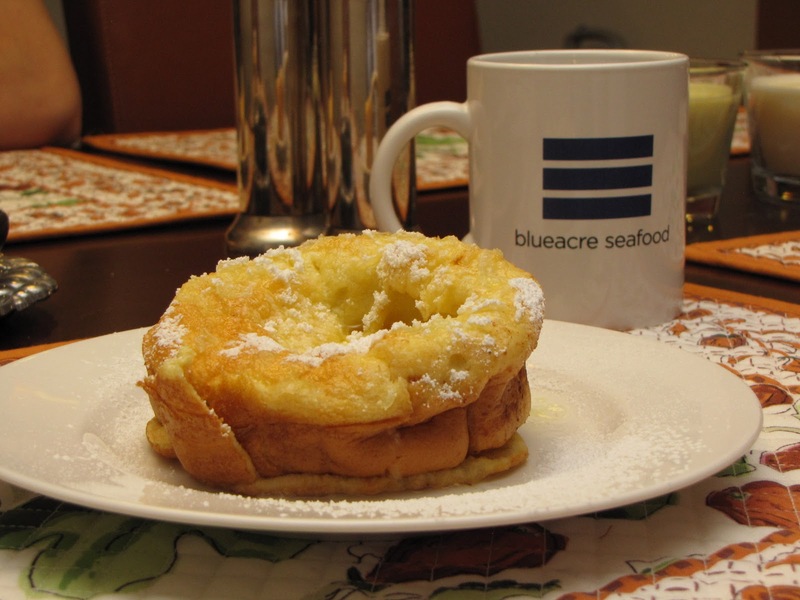 Dutch Babies were a staple there – said to be the first restaurant in the area to have them regularly on their menu. 2 Responses to "Oh, baby!" My mom used to make Dutch Babies for dinner! It was such a wonderful meal made with sauteed apples, powdered sugar and loads of sour cream. More like having dessert for dinner. Haven’t had one in ages! Thanks for the recipe! I’m allergic to dairy, so do you think that rice milk is too thin as a replacement? I’m not a soy milk fan, but might use it if it will work as well as whole milk.